Buckeye Valley’s Cami Crawford, left, and Olentangy Orange’s Riley Duffy battle for possession during the first half of Tuesday’s non-league showdown in Delaware. 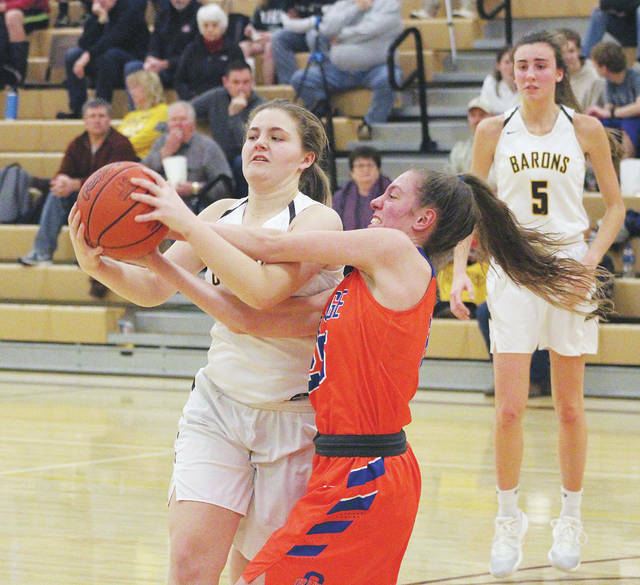 DELAWARE – Playing on her home floor for the final time, Hannah Cowan scored back-to-back baskets in the third quarter to break a 21-21 tie, giving the Buckeye Valley girls basketball team the lead for good. Cowan finished with 13 points, seven rebounds, three assists, three steals and a couple of blocks after being held scoreless in the first quarter of the Barons’ 41-33 win over Olentangy Orange in non-league play Tuesday night. Anika Craft finished with a double-double for the Barons (11-11), who used a 12-4 run to open the fourth quarter to create separation. Craft had 10 points, 14 rebounds and a couple of steals to back Cowan’s effort. Lauren Perone buried four 3-pointers and scored a game-high 16 points to keep the Pioneers close. She hit a 3 in the final seconds of the first quarter to tie the game 9-9 after BV opened the game 6-0. Joy Gimei hit a pair of free throws to give Orange its first lead at 11-9 early in the second quarter, but Cowan tied it with her first basket on BV’s next possession and Dani Grether found Chelsea Edington for a 3 to give the Barons a 14-11 lead with 4:58 left in the half. Edington finished with five points, five rebounds and a pair of steals for the Barons. Perone hit a pair of triples down the stretch to help the Pioneers close the half down 18-17. Maddie Erickson scored off a Riley Duffy steal to give Orange the lead with 7:22 left in the third. Anna Grabau had 10 rebounds and Duffy finished with four steals to lead the Pioneers (5-17). BV’s Reilly Taylor suffered a knee injury in the second quarter and did not return. BV was already working with a short bench after losing Maddy Fraker to a knee injury a couple of weeks ago. Both teams open tournament play next. Orange, seeded 34th in the Division I district tournament, travels to 11th-seeded Teays Valley in a first-round matchup Saturday at 1 p.m.
Buckeye Valley, seeded 16th in the Division II district tournament, travels to seventh-seeded Licking Valley in the first round Tuesday night at 7 p.m. The Delaware Hayes boys basketball team used a 23-3 third quarter — part of a 31-3 run to start to second half — to blow open a 69-33 win over Licking Heights in non-league play Tuesday night in Delaware. Jwan Lyles, Jack Weller and Paul Burris combined for 24 second-half points. Burris finished with a game-high 20 to lead the Pacers, who led 33-24 at the break. Hayes’ defense was on display as well. The Pacers held Licking Heights’ top player, Tyrese Hughey, scoreless in the second half. Josh Osei had 12 points to lead the Hornets. The Eagles outscored the host Lions 23-11 in the third quarter to break things open on the way to a league win Tuesday night in Westerville. Nathan Stewart led DCS with 14 points while Pryce Johnson added 12 in the win. Jake Elmore hit five 3-pointers on the way to a team-best 15 points and Sean Marks added 14 to lead the Braves to a lopsided non-league win over the host Presidents Tuesday night in Marion. Olentangy set the tone with a 22-13 first quarter and added to its lead from there. The Braves held Harding to a single point in the second quarter and outscored the hosts 20-8 in the fourth to smooth out the scoring summary.